Flowchart of the study, showing disposition of patients from screening to study completion. Consecutive patients with primary hypothyroidism who visited our clinics were assessed for study eligibility. Study exclusion criteria were gastrointestinal disorder, thyroid carcinoma, and pregnancy. Thyroid hormone levels after 6 and 12 weeks of morning or bedtime intake of levothyroxine sodium. To convert thyrotropin level to micrograms per liter, multiply by 1.0; free thyroxine level to picomoles per liter, multiply by 12.871; and total triiodothyronine level to nanomoles per liter, multiply by 0.0154. It seems fairly obvious that levothyroxine should be given and taken on an empty stomach in the morning, and this is how ALL medical doctors order it to be taken. 1. First of all, this study has been done by medical doctors who also have research degrees. So not ALL medical doctors agree. Traditional recommendation is valid however not proven by studies to be the best recommendation. This study wants to address that. 2. There were none prior studies made that proves taking in the morning is more effective than in the evening. NONE. Hence this study. 3. The recommendation that thyroxine should be taken on an empty stomach is correct since calcium and iron prevent absorption of thyroxine. HOWEVER, at bedtime your stomach is most likely to be empty as well. Therefore also valid. Background Levothyroxine sodium is widely prescribed to treat primary hypothyroidism. There is consensus that levothyroxine should be taken in the morning on an empty stomach. A pilot study showed that levothyroxine intake at bedtime significantly decreased thyrotropin levels and increased free thyroxine and total triiodothyronine levels. To date, no large randomized trial investigating the best time of levothyroxine intake, including quality-of-life evaluation, has been performed. Methods To ascertain if levothyroxine intake at bedtime instead of in the morning improves thyroid hormone levels, a randomized double-blind crossover trial was performed between April 1, 2007, and November 30, 2008, among 105 consecutive patients with primary hypothyroidism at Maasstad Hospital Rotterdam in the Netherlands. Patients were instructed during 6 months to take 1 capsule in the morning and 1 capsule at bedtime (one containing levothyroxine and the other a placebo), with a switch after 3 months. Primary outcome measures were thyroid hormone levels; secondary outcome measures were creatinine and lipid levels, body mass index, heart rate, and quality of life. Results Ninety patients completed the trial and were available for analysis. Compared with morning intake, direct treatment effects when levothyroxine was taken at bedtime were a decrease in thyrotropin level of 1.25 mIU/L (95% confidence interval [CI], 0.60-1.89 mIU/L; P < .001), an increase in free thyroxine level of 0.07 ng/dL (0.02-0.13 ng/dL; P = .01), and an increase in total triiodothyronine level of 6.5 ng/dL (0.9-12.1 ng/dL; P = .02) (to convert thyrotropin level to micrograms per liter, multiply by 1.0; free thyroxine level to picomoles per liter, multiply by 12.871; and total triiodothyronine level to nanomoles per liter, multiply by 0.0154). Secondary outcomes, including quality-of-life questionnaires (36-Item Short Form Health Survey, Hospital Anxiety and Depression Scale, 20-Item Multidimensional Fatigue Inventory, and a symptoms questionnaire), showed no significant changes between morning vs bedtime intake of levothyroxine. Conclusions Levothyroxine taken at bedtime significantly improved thyroid hormone levels. Quality-of-life variables and plasma lipid levels showed no significant changes with bedtime vs morning intake. Clinicians should consider prescribing levothyroxine intake at bedtime. Trial Registration isrctn.org Identifier: ISRCTN17436693 (NTR959). Because the prevalence of primary hypothyroidism is high among the general population,1,2 levothyroxine sodium is one of the most prescribed medications. Absorption of levothyroxine is approximately 70% to 80% and occurs in the small bowel.3 There is consensus that levothyroxine should be taken before breakfast to prevent interference of its intestinal uptake by food or other medications.4-10 In our clinics, we observed several patients whose thyroid hormone levels improved markedly after changing the scheduled intake of levothyroxine to bedtime. A pilot study11 confirmed this observation among 11 patients. The mean (SD) plasma thyrotropin level significantly decreased from 5.1 (0.9) to 1.2 (0.3) mIU/L (to convert thyrotropin level to micrograms per liter, multiply by 1.0), and free thyroxine (FT4) and triiodothyronine (T3) levels increased when levothyroxine was taken at bedtime. The circadian pattern of thyrotropin rhythm remained intact, which was important regarding the time of blood sampling for thyrotropin levels to monitor levothyroxine therapy. The primary objective of this study was to determine whether a change occurred in thyrotropin and thyroid hormone levels when levothyroxine was taken at bedtime vs in the morning. We further investigated whether a bedtime regimen would affect creatinine and lipid levels, body mass index, heart rate, and QOL. A randomized double-blind crossover trial was performed among consecutive patients with primary hypothyroidism who visited our clinics. The patients had to be 18 years or older and have been on a stable levothyroxine regimen for at least 6 months. Patients with a gastrointestinal tract disorder, those with thyroid carcinoma, and those who were pregnant were excluded from the study. Also excluded were patients who were taking medication known to interfere with the uptake of levothyroxine.4,7-10 The medical ethics committee of the Maasstad Hospital Rotterdam in the Netherlands approved the study protocol, and written informed consent was obtained from each patient. After informed consent had been obtained, patients were randomized to start the study period with 1 capsule of levothyroxine in the morning (and 1 capsule of placebo at bedtime) or with 1 capsule of levothyroxine at bedtime (and 1 capsule of placebo in the morning). After 3 months, patients were switched from levothyroxine in the morning to placebo and vice versa for another 3 months. Double-blind study medication was provided by the hospital pharmacy, which performed the randomization. Commercial levothyroxine sodium tablets (Thyrax Duotab, 0.100 mg; Organon, Oss, the Netherlands) were used and were reformulated as capsules with lactose monohydrate as the single excipient (in compliance with Good Manufacturing Practice guidelines, annex 13, manufacture of investigational medicinal products). Every patient received study capsules containing a similar dose of levothyroxine as before entry into the trial. Placebo and levothyroxine capsules were visually identical. Patients were instructed by a research nurse to take the morning capsule on an empty stomach half an hour before breakfast and the bedtime capsule at night just before going to bed. At baseline and every 6 weeks, patients were seen in our clinics by a research nurse. At these visits, blood samples were obtained to determine plasma thyrotropin, FT4, T3, creatinine, and lipid levels, and blood pressure, heart rate, and body weight were measured. The remaining capsules in the containers were counted to check for compliance. Quality-of-life questionnaires were completed by patients at baseline, at 3 months, and at the end of the study. Blood samples were drawn on the morning of the planned visit to the research nurse. Capsules were not withheld on the day of blood sampling. Serum thyrotropin levels (reference range, 0.4-4.0 mIU/L) were measured by immunometric assay (Immulite 2000; DPC Nederland, Breda, the Netherlands), with a detection limit of 0.002 mIU/L. Levels of FT4 (reference range, 10.0-24.0 pmol/L; equivalent to 0.78-1.86 ng/dL) and T3 (reference range, 1.23-2.80 nmol/L; equivalent to approximately 80-182 ng/dL) were measured by competitive immunoassay (Immulite 2000). Creatinine and lipid levels were also measured (Dimension RxL; Dade Behring, Deerfield, Illinois). Three QOL questionnaires (36-Item Short Form Health Survey, Hospital Anxiety and Depression Scale, and 20-Item Multidimensional Fatigue Inventory) and a specific questionnaire about symptoms of hypothyroidism and hyperthyroidism were completed by patients at baseline, at 3 months, and at the end of the study. Patients completed the questionnaires under the supervision of a research nurse. 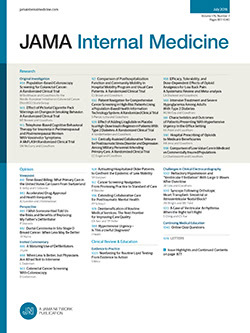 The 36-Item Short Form Health Survey is a general QOL questionnaire that comprises 8 scales.18 The Hospital Anxiety and Depression Scale consists of 14 items pertaining to anxiety and depression.19 The 20-Item Multidimensional Fatigue Inventory measures 5 different dimensions of fatigue.20 The specific questionnaire for thyroid symptoms assesses 14 symptoms of hypothyroidism and 6 symptoms of hyperthyroidism.21 At the end of the trial before the randomization code was broken, patients were asked during which period of the trial they had felt better. After the trial ended, patients were free to choose at what time of day they preferred to continue taking levothyroxine, in the morning or at bedtime. One year after the trial, we asked every patient at what time he or she was taking the levothyroxine tablet. The primary end point was a change in thyroid hormone variables (thyrotropin, FT4, and total T3 [TT3] levels) between 12 weeks of morning levothyroxine intake and 12 weeks of bedtime levothyroxine intake. Secondary end points were changes in QOL (measured by 3 questionnaires), thyroid symptom score, body mass index, heart rate, and serum lipid and creatinine levels. The direct treatment effect among all variables was measured by performing an independent-samples t test between the differences of week 12 and week 24 in the first group (started with morning levothyroxine) and the second group (started with bedtime levothyroxine).22 The presence of a carryover effect from one period to the other was measured by performing an independent-samples t test on the sum of the variables at 12 and 24 weeks in each patient. All P values were 2-sided and were not adjusted for multiple testing. All calculations were performed using commercially available statistical software (SPSS 17.0 for Windows; SPSS Inc, Chicago, Illinois). To calculate the sample size, we assumed that a difference in thyrotropin level of 1.0 mIU/L between morning and bedtime ingestion of levothyroxine would be clinically relevant. From previous results in a pilot study, we calculated that the standard deviation of the difference between morning and bedtime administration would be between 2.5 and 3.0 mIU/L. Based on these calculations, a sample size of 75 patients would give at least 80% power to detect a significant difference of 1 mIU/L between morning and bedtime administration. Between April 1, 2007, and November 30, 2008, a total of 141 consecutive patients with primary hypothyroidism were assessed for study eligibility. Ultimately, 105 patients met the inclusion criteria and gave written informed consent. Reasons for exclusion were current use of interfering medication (n = 11), history of thyroid carcinoma (n = 3), unusual dosage of levothyroxine (n = 6), treatment for breast cancer (n = 1), and Addison disease (n = 1). Fifteen randomized patients withdrew their consent shortly after enrollment in the trial and had baseline data only. The baseline characteristics of these patients did not differ from those of patients who completed the trial. Data for the entire 24 weeks were available for 90 patients (86%) who enrolled in the trial, 47 of whom started with levothyroxine intake in the morning and placebo at bedtime and 43 of whom started with levothyroxine intake at bedtime and placebo in the morning (Figure 1). Baseline characteristics of the 2 groups are given in Table 1. There were differences between the 2 groups in the proportions of male patients, levothyroxine dosages, and thyrotropin levels. On average, patients missed a mean (SD) of 1.3 (6.0) capsules in the morning and 1.9 (10.1) capsules in the evening during 24 weeks of the trial (P = .54). Because there were no severe symptoms related to hypothyroidism or hyperthyroidism, no patient required a change in levothyroxine dosage during the trial. Results of the primary outcomes are summarized in Table 2 and in Figure 2. Among the group that received morning levothyroxine first, the mean (SD) thyrotropin level decreased from 2.66 (2.53) mIU/L at 12 weeks to 1.74 (2.43) mIU/L at 24 weeks. In contrast, among the group that received bedtime levothyroxine first, the mean (SD) thyrotropin level increased from 2.36 (2.55) mIU/L at 12 weeks to 3.86 (4.02) mIU/L at 24 weeks. When overall changes were compared between the 2 groups, bedtime levothyroxine intake was found to have a direct treatment effect, with a decrease in thyrotropin level of 1.25 mIU/L (95% confidence interval [CI], 0.60-1.89 mIU/L; P < .001) relative to morning levothyroxine intake. The mean (SD) FT4 level in the group that received morning levothyroxine first increased from 1.48 (0.24) ng/dL at 12 weeks to 1.59 (0.33) ng/dL at 24 weeks. In the group that received bedtime levothyroxine first, the mean (SD) FT4 level decreased from 1.54 (0.28) ng/dL at 12 weeks to 1.51 (0.20) ng/dL at 24 weeks. Therefore, bedtime levothyroxine intake resulted in a direct treatment effect, with an increase in FT4 level of 0.07 ng/dL (95% CI, 0.02-0.13; P = .01) relative to morning levothyroxine intake. Changes in TT3 levels were similar to changes in FT4 levels. In the group that received morning levothyroxine first, the mean (SD) TT3 level increased from 121.2 (28.1) ng/dL to 127.0 (31.6) ng/dL. In the group that received bedtime levothyroxine first, the mean (SD) TT3 level decreased from 128.4 (30.6) ng/dL to 121.9 (36.3) ng/dL. In this case, the direct treatment effect of bedtime levothyroxine was an increase in TT3 level of 6.5 ng/dL (95% CI, 9.0-12.10 ng/dL; P = .02). No first-order carryover effect was found for thyrotropin, FT4, or TT3 levels. There were no differences between the 2 study groups in serum creatinine or lipid levels, blood pressure, body mass index, or heart rate. These results are summarized in Table 2. The 36-Item Short Form Health Survey, Hospital Anxiety and Depression Scale, and 20-Item Multidimensional Fatigue Inventory showed no differences in subscale or total scores between the periods of morning vs bedtime intake of levothyroxine (Table 3). Hypothyroidism symptoms were unchanged between the 2 periods, despite improved thyroid hormone profiles, nor was there a difference in hyperthyroidism symptoms. When asked at the end of the trial (before the randomization code was broken), 34 of 90 patients said that they felt better during the period of morning intake of levothyroxine, 31 patients preferred the period of bedtime intake, and 25 patients indicated no preference. At 1 year after completion of the trial, more than half of the patients still preferred bedtime intake of levothyroxine. We performed this large, randomized, double-blind crossover trial among 90 patients to address whether levothyroxine taken at bedtime instead of in the morning improves thyroid hormone levels. The primary outcomes show a decrease in thyrotropin level of 1.25 mIU/L and an increase in FT4 and TT3 levels when levothyroxine is taken at bedtime. Despite the change in thyroid hormone levels, the patient QOL did not differ. Bedtime levothyroxine intake could be more convenient for patients, as they do not have to postpone breakfast. After our study was completed, more than half of the patients decided to continue with bedtime intake of levothyroxine. How can the bioavailability effects of levothyroxine be explained? An interval of 30 minutes between taking levothyroxine and eating breakfast may be too short to prevent interference with gastrointestinal absorption of levothyroxine. Moreover, many patients drink coffee in the morning, often instead of eating breakfast,6 or may take other medications that interfere with levothyroxine absorption. In contrast, most patients in our study stated that they had eaten no food or snacks for several hours before bedtime, this being their usual routine. Bowel motility is slower at night, resulting in more prolonged exposure of levothyroxine to the intestinal wall and, consequently, in better bioavailability.23 Furthermore, basal gastric acid secretion is highest in the late evening and is lowest in the morning.24 An acidic environment promotes the absorption of levothyroxine.25 These circadian differences in gastrointestinal function could be a pathophysiological explanation for our findings. Primary outcomes of this study are consistent with results of an earlier pilot study.11 Two other studies on the timing of levothyroxine intake have been published. In a retrospective medical record review of 15 nursing home residents, Elliott35 observed a nonsignificant decrease in thyrotropin levels when levothyroxine intake was switched from after breakfast to midnight. The findings in that nonrandomized trial confirm the results of our study. A 3-period crossover design study36 showed higher thyrotropin levels when levothyroxine was taken at bedtime instead of before breakfast, but there was no change in FT4 or TT3 levels, as in our study. The exclusion criteria for that study were extensive, and only 19% of eligible patients were agreeable to participation. The study also included patients with thyroid cancer, whose thyrotropin levels were maintained at lower levels than those of the rest of the population. Therefore, we believe that the findings in that study extend the generalizability of our study results to the treatment of primary hypothyroidism. Lower thyrotropin levels associated with levothyroxine intake before breakfast vs at bedtime intake in that study could be explained by the longer interval between levothyroxine intake and breakfast (60 minutes vs 30 minutes in our study). Also, most patients in our study stated that they had nothing to eat (or only a small snack) for several hours before bedtime, which differs across cultures. In all studies performed on the timing of levothyroxine ingestion, intake on an empty stomach seems to result in maximal absorption of levothyroxine. Our study shows that if this fasting regimen can be achieved at bedtime, then resulting thyroid hormone levels are better than those associated with levothyroxine intake 30 minutes before breakfast. The crossover design of our study has the advantage that each patient served as his or her own control. Therefore, a statistical difference in thyrotropin values at baseline will not influence primary and secondary outcomes of the study. The study design has potential limitations, including order and sequence effects. We found no first-order carryover effect between the 2 periods, but we looked at no other order or sequence effects. It should also be noted that this was a single-site study in the Netherlands, where eating habits might be different from those in other countries or cultures. Based on the results of our study, clinicians should inform patients with hypothyroidism that levothyroxine intake at bedtime is a good alternative to levothyroxine intake in the morning, provided that levothyroxine is taken on an empty stomach. For patients who do not attain normal thyrotropin or FT4 levels with morning levothyroxine intake, a switch to bedtime is recommended. Recommendations on timing of levothyroxine intake and on uptake interference by food are found in few guidelines about the management of hypothyroidism.37,38 Drug information resources and guidelines require revision in this respect. In conclusion, bedtime intake of levothyroxine in our study significantly improved thyroid hormone levels. This may be explained by better gastrointestinal bioavailability at night or by less uptake interference by food or medications. As shown in this study, bedtime administration is more convenient for many patients. Clinicians should inform their patients about the possibility of taking levothyroxine at bedtime. A prolonged period of bedtime levothyroxine therapy may be required for a change in QOL to occur. Correspondence: Nienke Bolk, MD, Department of Internal Medicine, Maasstad Hospital Rotterdam, 315 Groene Hilledijk, 3075 EA Rotterdam, the Netherlands (nienkebolk@hotmail.com). Accepted for Publication: June 1, 2010. Authors Contributions: Dr Bolk had full access to all the data in the study and takes responsibility for the integrity of the data and the accuracy of the data analysis. Study concept and design: Bolk, Visser, and Berghout. Acquisition of data: Bolk, Jongste, and Berghout. Analysis and interpretation of data: Bolk, Visser, Nijman, Tijssen, and Berghout. Drafting of the manuscript: Bolk, Visser, Nijman, Jongste, Tijssen, and Berghout. Critical revision of the manuscript for important intellectual content: Visser, Tijssen, and Berghout. Statistical analysis: Nijman and Tijssen. Administrative, technical or material support: Nijman and Jongste. Study supervision: Berghout. Previous Presentation: These study data were presented in preliminary form at the 91st Annual Meeting of The Endocrine Society; June 11, 2009; Washington, DC. Additional Contributions: Liesbeth Ruygrok, PhD, oversaw preparation of the levothyroxine and placebo capsules and randomization of the patients. Maasstad Hospital Rotterdam laboratory technicians processed the blood samples, and employees of the Department of Internal Medicine assisted with patient assessment. We thank the patients who participated in this study for their cooperation.